I think Davidoff makes amazing cigars. The quality of tobacco and level of craftmanship is always outstanding. I really enjoy Davidoff's fuller bodied cigars such as the new Puro d'Oro and I especially like the Davidoff Seleccion 702 Limited Edition 2009. Both of these cigars have more of the deeper, richer flavors that I look for in a cigar and the newest Limited Edition from Davidoff has just those qualities. 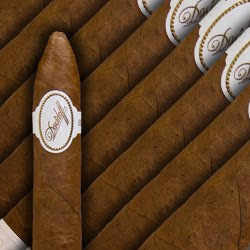 The Davidoff Belicoso Supremo White Edition 2011 is medium to full-bodied with notes of coffee and leather, but the best aspect of the cigar is the amazing spice rack notes that are tasted when retro-nasally exhaled. The cigar hits every part of the tongue making it a well balanced mouth watering experience. I would have to say this cigar ties the Seleccion 702 for my favorite Davidoff cigar. Both cigars are an amazing experience. To buy Davidoff Belicoso Supremo <---Click Here.